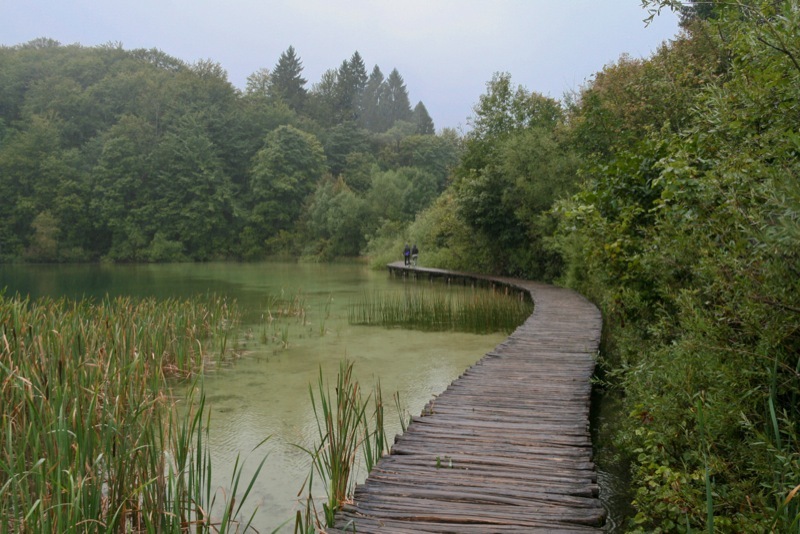 For exploring the Plitvice Lakes National Park best, there really is nothing better than to walk (or hike) through the Park. You’ll be able to take in the beautiful surroundings and admire the lakes, waterfalls, nature and wildlife. Whether you start at Entrance 1 (the lower lakes) or Entrance 2 (upper lakes), there’s much to explore. The Park prints out/displays maps for a number of different sightseeing walks, of varying lengths, that can be undertaken starting from either entrance – who’s tough enough for the 8 hour sightseeing walk?! Take a look at one of the ‘visiting programmes‘ if you want to be guided through the park. In answer to a question we sometimes receive – no swimming (or any other kind of water activity) is allowed anywhere in the Park. Plitvice’s wonderfully clear waters need to be kept that way! There’s of course stunning scenery almost everywhere you turn in the Park – but for amongst the best photo opportunities (looking down on the lakes and waterfalls from up high – as seen below) it’s entrance 1 that you want to head to. From the entrance, head down the winding gravel path to reach the wooden walkways to cross the lakes From this viewpoint, it looks like the lakes stretch out for miles! 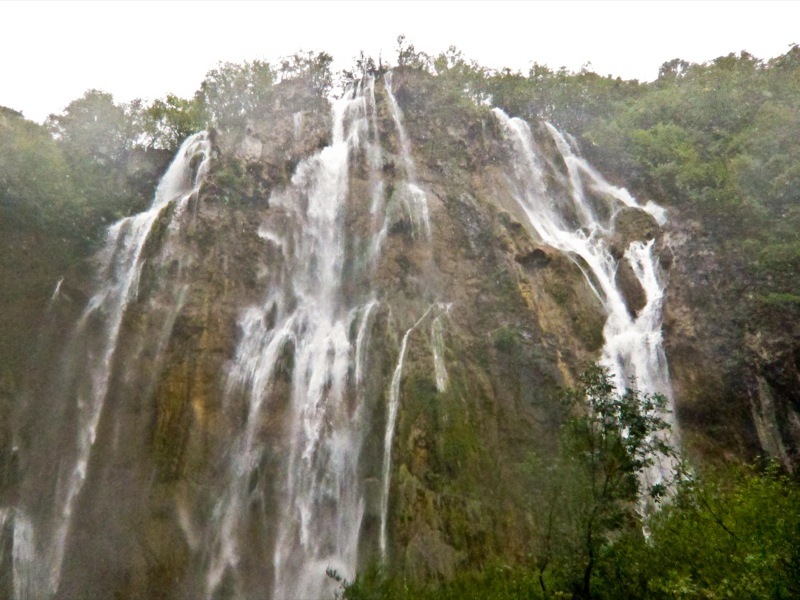 You’ll soon see a sign indicating Veliki Slap (Large Waterfall) that points to your right – as you walk down more wooden walkways, there’s also plenty more impressive waterfall sights on the way down. There’s a small area in which to stand ‘underneath’ Veliki Slap for more photo taking! Head back the way you came, but not back to the entrance yet. Now you can explore more of the wooden walkways that stretch out over the lakes. Entrance 1 is also where Supljara Cave is located, which houses its own unique type of fauna. Walk up through the cave for more wonderful and unique sights of the lakes. From Entrance 2 you can choose to start your exploration either by taking an electric boat across the largest lake in the park, or the ‘panoramic train’ (i.e. a shuttle bus) up to higher points in the park. You can also of course take the train back down to the entrance. We’re recommend taking the train first and then walking down the pathways that wind through the Park. This is a circular tour that may take a good two or three hours. You’ll end up at the largest lake – Kozjak – where you can take the electric boat back to Entrance 2. You’ll walk past plenty of large lakes and lots of smaller waterfalls; check out the wonderfully clear water as well to see plenty of plant life and submerged trees where they’ve fallen at some point in the past. 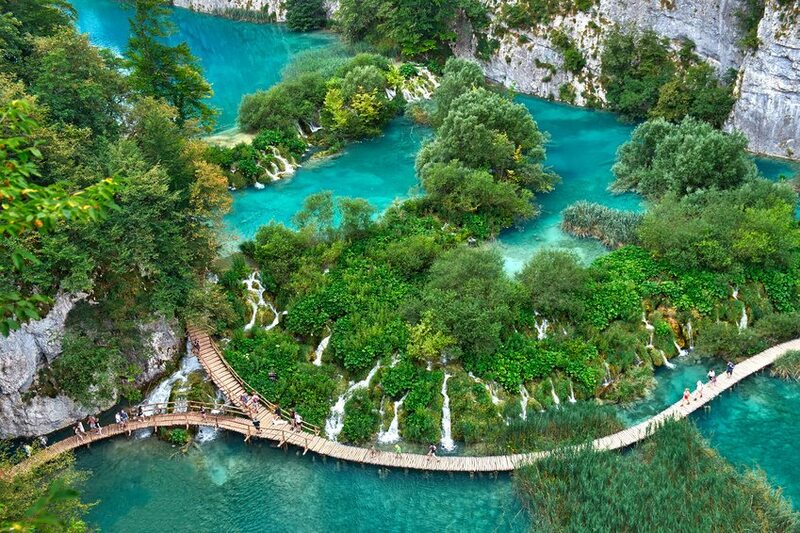 Although technically Plitvice is home to a number of animals, you’ll most likely only see fish. It’s still glorious to see them in their masses in the waters!